Surprise, it's a bonus post! In tomorrow's post, I'll be showing you what I'm wearing on Thanksgiving, but first, let's plan our Black Friday shopping outfits. Now, I prefer to shop online from the comfort of my own home, but this is a comfy option even if you plan on braving the crowds at the mall. 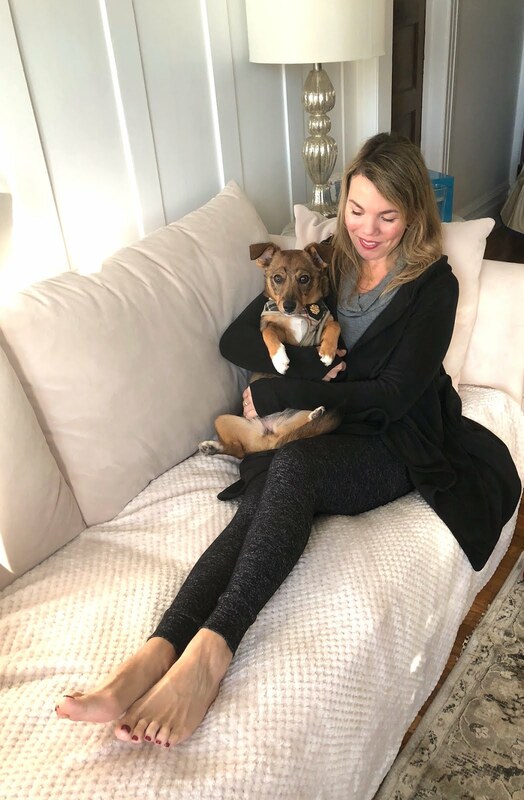 I've partnered with Cuddl Duds and Macy's to show you the perfect thing to wear. It's all about soft, cozy layers. Let's break it down. 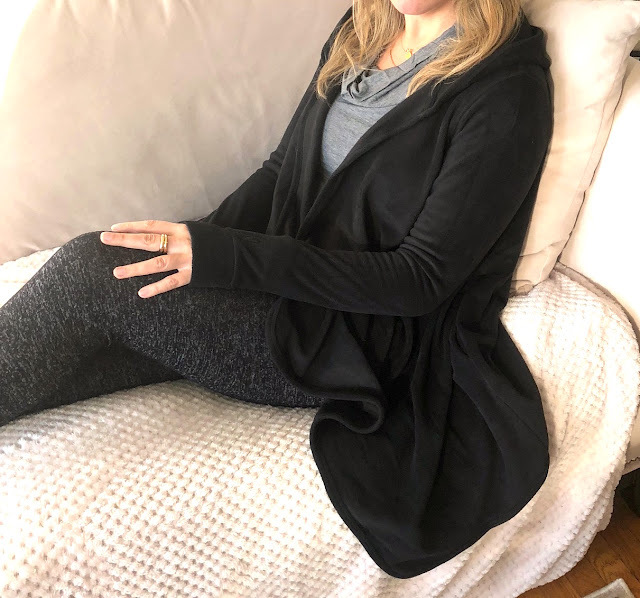 I'm wearing the Softwear Cowl Tunic in charcoal heather and the Soft Knit Leggings in dark charcoal under the Fleecewear Wrap in black. The tunic is a little on the lighter side, which makes it a good base layer. I love the drapey neckline and think it will be super cute layered under a boyfriend blazer on my non-lazy days. The fleece wrap is much thicker—it's basically like enveloping yourself in a big ol' blanket. My favorite part is that it's hooded! Although my second-favorite part is that both the tunic and the wrap have thumbholes, which is super handy if you have cold hands (which I often do in the winter). I'm wearing a size small in everything here—it's all true to size, and forgiving at that. I've been looking for a new pair of comfy leggings for awhile, so these were like a godsend—they are incredibly soft, and I like how the waistband has a V in the front (I'd show you a photo but don't want to scar you for life). The ankle cuff is cute and flattering too. I am currently plotting different ways to style these so I can wear them in public; I'll report back to you soon! All of these pieces are so crazy soft, and they also happen to be 25% off at Macy's until 11/20, so now's the time to shop—you obviously want to have your Black Friday outfit ready ahead of time! Of course, if you want to spend your Black Friday snuggling, that's ok too—Zuni approves of this plan! Cheryl, this is the perfect Black Friday snuggle outfit! I will be working all day from 10 am until 11 pm, so I will definitely be wearing something comfortable, too! A black outfit will always do the trick for me! Thanks for linking up to The Wednesday Blog Hop. I only shop on line, so I have a few things left to buy. 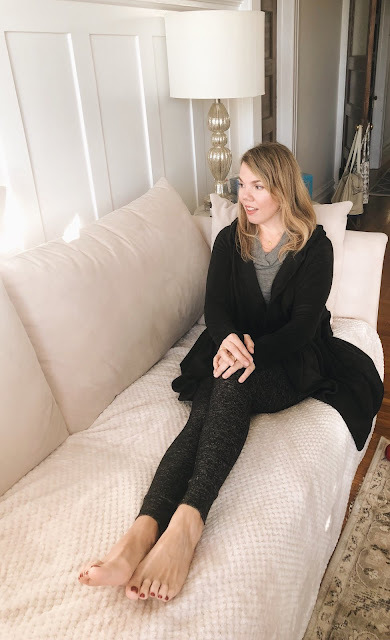 I love this soft and cozy outfit and you cant beat shopping in the comfort of your own home and comfy clothes!